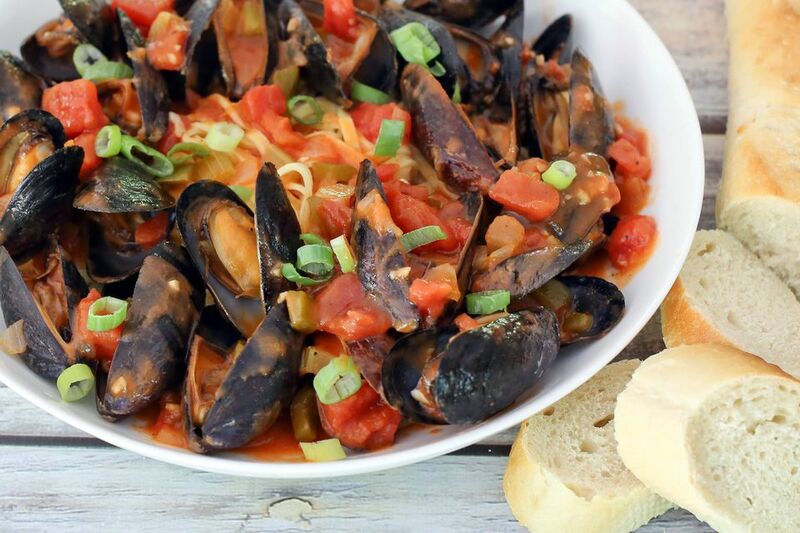 These Louisiana-style mussels make a fabulous meal for two with pasta. The sauce is a flavorful sauce made with tomatoes, garlic, and the "holy trinity" of Cajun cooking. To serve four as an appetizer, omit the pasta and serve with the sauce, along with garlic bread or sliced French bread. Scrub the mussels under cold running water and remove any beards* they may have. Farm-raised mussels are already quite clean and they tend to have fewer beards, so don't worry if you don't see any. Discard cracked or damaged mussels, and any that stay open even after light tapping. In a large stockpot or Dutch oven over low heat, melt the butter. Add the flour and cook, stirring constantly, for 5 to 7 minutes, or until the roux is light brown, or "blonde." Add the onion, bell pepper, and celery; stir to blend with the roux. Cover and cook over low heat until for 6 to 8 minutes, until the vegetables are softened. Stir occasionally. Stir in the tomatoes, tomato paste, broth or clam juice, and lemon juice, along with the cayenne and black peppers and oregano. Simmer sauce, uncovered, stirring occasionally, 15 minutes, or until thickened. Add the mussels to the sauce; stir. Cover and continue simmering over low heat for 5 to 8 minutes, until the mussels open. Cook the linguine in boiling salted water following package directions. Drain. Remove the opened mussels to a large bowl and discard any unopened mussels. Taste the sauce and add kosher salt or sea salt, if needed. Divide the pasta between two wide, shallow bowls. Arrange the mussels around the pasta. Spoon sauce over all. *The "beards" on mussels are fibers which help them attach to other mussels and hard surfaces, and are more common on wild mussels. To remove a beard, just grab it near the mussel and give a good tug. **The mussels will naturally release some salty liquid into the sauce as they cook, so taste the sauce after the mussels have opened before adding more salt.